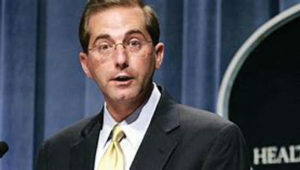 With the growing lack of affordable health care options causing uneasiness in African American and minority communities across the country, Health and Human Services Secretary Alex Azar has direct-ed the Food & Drug Administration to establish a working group to explore the possibility of permitting drug imports in circumstances like when there’s a significant price increase on a drug produced by a single manufacturer without the protection of patents or exclusivities. Azar has also vowed that President Donald Trump’s health plans are far more suitable than any choice under Obamacare, which the White House continues to gut through executive orders and other strategies designed to kill the law that protected the health insurance needs of millions of underrepresented Americans. After seeking an interview with Azar, his office made available Dr. Matthew Lin, Azar’s deputy assistant secretary for Minority Health and director of the HHS Office of Minority Health. When asked what his boss’ response would be regarding how rising insurance rates would affect minorities and the poor, Lin told NNPA Newswire that a key priority at HHS is to improve the availability and affordability of health insurance for all Americans. “HHS joined the departments of Labor and the Treasury in issuing a final rule that allows insurance companies to sell and renew short-term, limited duration health insurance plans,” Lin said. “What we’re trying to do here is make more options available. This step ensures that people will be able to work with their insurance company as the company determines what will be covered and at what price,” he said. Those plans currently exist, but coverage is limited to less than three months. Under the new rule, Lin said the plans are available for up to 12 months, and they can be renewed for up to three years, depending on their negotiations with their insurance company and state law. “We believe in options and this is a really important option for millions of Americans who don’t have access to affordable health insurance,” he said. Recently, Azar blamed higher prices in the United States on “single-payer, socialist” healthcare systems in the European Union and in Canada where government regulators determine prices. When asked whether lowering drug costs by allowing price negotiation through Medicare Part D, Azar reportedly remained opposed, saying it would create a national formulary like those European systems. “I don’t believe we want to go there,” he said. Lin said the current focus is to see that the United States has the best possible system to enhance and protect the health and well-being of all Americans. “We continually work within government and with experts and stakeholders outside of government to identify opportunities to improve the health and health care of every American, by providing effective health and human services and fostering advances in medicine, public health and social services. Our goal is to find out what works and then make those solutions available to as many people as possible,” he said. Within the Office of Minority Health at HHS, Lin and others are charged with working to see that all residents have the best possible opportunity to reach their full potential for good health, he said. The office was created as a direct outcome of the Report of the Secretary’s Task Force on Black & Minority Health, released in 1985. A year later, the Office of Minority Health was created, with a mission to improve the health of racial and ethnic minority populations through the development of health policies and programs to help eliminate health disparities. “We work with agencies within HHS and across the federal government. We also know that in order to be successful in addressing health disparities, we will need more than a federal response,” Lin said. “So, we also work with state and local organizations dedicated to achieving health equity. We engage individuals, community organizations, faith groups, tribal leaders and other stakeholders across the country,” he said. Today, the office has infrastructure, staff and partners in all 50 states, as well as in eight U.S. territories. There are also six additional offices of minority health within HHS at the Agency for Healthcare Research and Policy; Centers for Disease Control and Prevention; Centers for Medicare and Medicaid Services; Food and Drug Administration; Health Services and Resources Administration; the National Institute on Minority Health and Health Disparities at the National Institutes of Health; and the Substance Abuse and Mental Health Services Administration. “And all are working daily – whether it’s Sickle Cell Disease, HIV prevention or heart health – to improve the health of African Americans and all of the communities we serve,” Lin said. With Open Enrollment on the horizon and an acknowledged need to provide information to minority communities, Lin wouldn’t say what HHS would commit to in terms of reaching African-American and other communities of color with important details about health coverage. The noncommittal could be disconcerting considering the Government Accountability Office’s report in July that revealed federal agencies like HHS have spent a combined $5 billion in advertising over the past five years but just $50 million with Black-owned newspapers. “Advertising isn’t a large part of the work we do at the Office of Minority Health, but working with media companies that reach black and other minority communities is an important part of accomplishing our mission,” Lin said. “So we also work with state and local organizations dedicated to achieving health equity. We engage individuals, community organizations, faith groups, tribal leaders and other stakeholders across the country,” he said. With Open Enrollment on the horizon and an acknowledged need to provide information to minority communities, Lin wouldn’t say what HHS would commit to in terms of reaching African American and other communities of color with important details about health coverage.